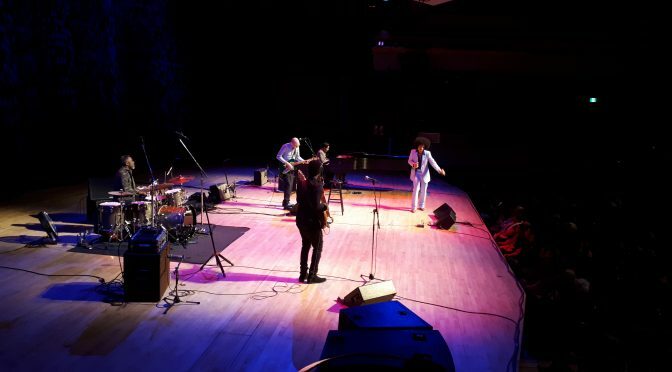 It was a show in tribute to jazz icon Bill Withers last night at the Jack Singer. As you can see, I had a choice seat. I got to say that one of my highlights was witnessing the pure joy of an audience in awe of this rising star, Jose James. One particular young woman simply beamed in delight and in fact one memorable moment was our eyes colliding upon intercepting witty stage talk. Tracks “Who Is He”, and “Ain’t No Sunshine” particularly stood out along with the groovy closer which turned a classy looking opera hall into a speakeasy lookalike. This fellow, James, possesses a stage charm inviting onlookers into his act from the outset. His voice is stellar with a wide range and particularly appealing in tenor like phrasing. The band was strong with frequent solos from lead man Brad Allen Williams. The only pedal featured that I could see from my quaint corner spot during the evening was a wah brandished in “Grandma’s Hands”. All members had their solo spots. James’ admiration for Bill Withers was genuine and lucky for us all in the end, James encored with one of his own.